Hi everyone. 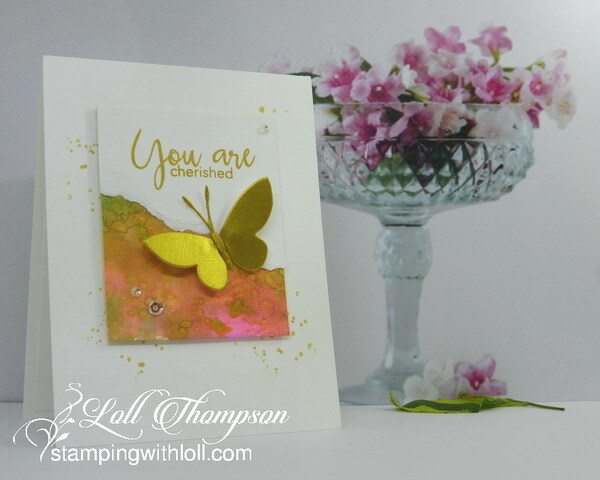 Today is a reminder card for the CAS Watercolour July Challenge - Butterfly. I used a piece of watercoloured tissue paper for my background. Click HERE to see my video tutorial on how this was made. I added some Delicata Gold ink to my watercoloured tissue paper for some shimmer. I squirted Delicate Gold reinker onto my craft mat, spritzed with water to dilute and then moved the gold ink around with a palette knife. Then I dipped my dried watercoloured tissue paper gold ink, randomly. The same colour inks was used for stamping the splat background. I added a torn piece of white card stock on top and stamped the sentiment. The same gold was used to colour the butterfly. I just love this yellow-gold colour with sparkles. I added three sequins for more sparkle. My CAS Mix Up card has stamping, tissue paper watercolouring, splattering, torn edge, and die-cutting. 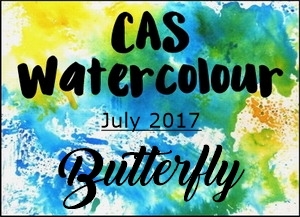 I hope you'll check out the CAS Watercolour July Challenge Reminder post to see all the beautiful butterfly cards from our talented Design Team, as well as our wonderful Guest Designer, EunJi. I know you'll be inspired. Then come play along! The challenge is open for just over a week. Since I have some tissue paper on the card ... I'm also sending this card over to the CAS Mix Up July Challenge - Tissue Paper gallery. :) Hope you'll come join us there too! Your Birthday card for our Cherished, Bonnie is so perfect, Loll. I Love your smooshed tissue paper, splatters, gorgeous butterfly and wonderful sentiment. TFS my friend. Hugs..
this is so wonderfully done mf...looks amazing! Your colors are fabulous on this, Loll. How I love the effect of the torn paper. I'm sure Bonnie will treasure this one! SO beautiful! Oh, Loll, you warm my heart! I can't wait to get this card so I can get a closer look and study it! The gold is so elegant and I love the effect of the torn edge over the tissue! I too cherish our friendship, my friend! Love this background too! Beautful card! How did you apply the gold Delicata highlights? Did you spritz it on or just apply directly? Oh Loll how beautiful and 'gold' this is - love it! Such a beautiful card, Loll! You did an amazing job on it. Your friend is very lucky indeed! You are so thoughtful! Have an amazing day. Hello Loll! Like a bad penny I have turned up again! And my haven't you created some more stunningly amazingly fabulous things? I have ferreted them all away for future use as always! The watercoloured tissue idea is one I will try as soon as I am home for more than 2 days. The angled butterfly design is gorgeous and the Split Panel is really effective and another one I will try. Such a beautiful watercolored panel, Loll! 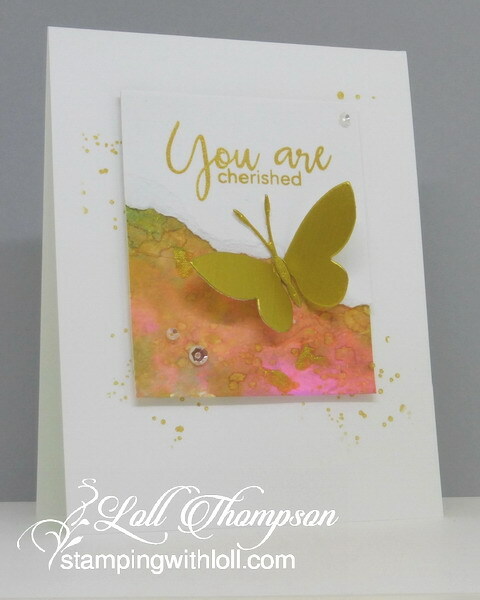 I love that you used Delicata Gold to add shimmer to your design and your splatters are the perfect touch on this card! You sure know how to inspire us...Thank you! Stunning! Love the gold and the design. I'm sure Bonnie loves it! Your tissue paper panel is positively luscious, Loll and the gold ink spatters are a lovely touch. Amazing golden glow! Very elegant card, perfect for an expensive friend. Bonnie will be delighted. What a great project. I'm going to start calling you the Queen of Paper Colorists. I tried to think of another word but what you do with so many different techniques to color your backgrounds earned you the title.